1.Prepare Topping: In small bowl, stir together all ingredients; refrigerate until ready to serve. 2.Prepare Peach Filling: In large skillet, melt butter over medium heat; stir in brown sugar, honey and cinnamon. Add peaches and cook 6 to 8 minutes or just until peaches are tender, stirring frequently. Stir in flour and cook 30 seconds. Remove skillet from heat and let cool 5 minutes. 3.Place tart crusts on baking sheet. 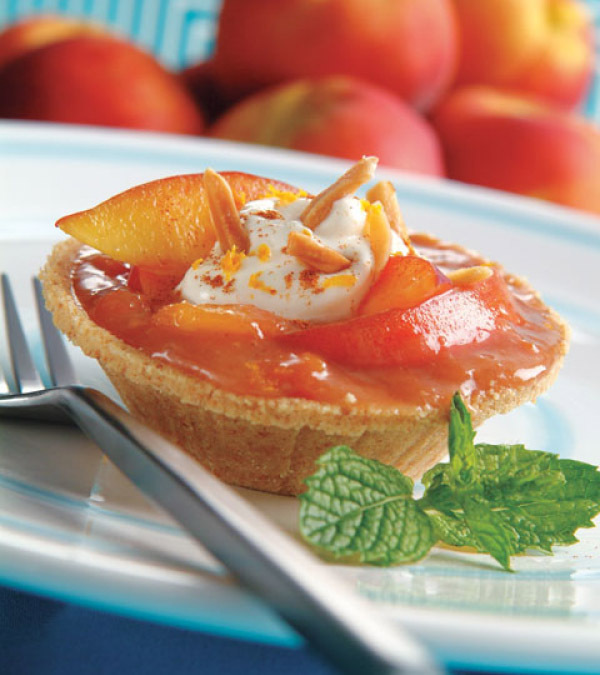 Evenly distribute Peach Filling into tart crusts. Cool at least 30 minutes before serving. 4.To serve, dollop Topping evenly over tarts, and sprinkle each with cinnamon and almonds. Serve immediately.